In an age of unprecedented high atmospheric carbon dioxide levels, the question of whether or not plants and trees can utilize excess carbon through photosynthesis is one of paramount importance. Researchers have observed what has been called the CO2 fertilization effect, whereby plants' rates of photosynthesis increase in response to higher levels of CO2 in the atmosphere, although this is thought to be dependent on various other factors such as temperature, moisture, nutrient availability, etc. A group of researchers from Quebec sought to better understand how the oldest boreal trees in North America—Thuja occidentalis L, white cedar—have responded to higher levels of atmospheric CO2 (ca) in terms of these trees' intrinsic water use efficiency (iWUE). Claudie Giguere-Croteau and colleagues published their study "North America's oldest boreal trees are more efficient water users due to increased [CO2], but do not grow faster," recently in PNAS. Their study of white cedar trees from the southern edge of the North American boreal forest comprises a dual-isotope analysis of rings from 715-year-old trees located around the shores of Lake Duparquet in Quebec. 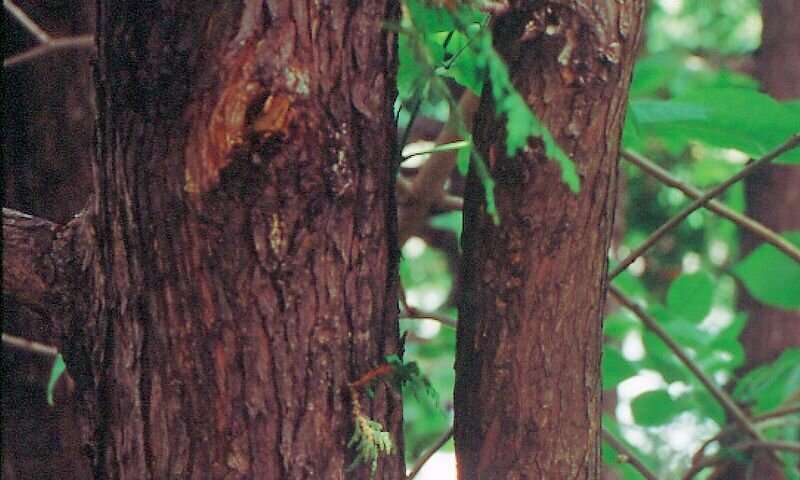 The extreme old age of the trees is significant in that the sampled growth rings provide hundreds of years of climate and growth condition data prior to the onset of the Industrial Revolution and the concomitant increase in atmospheric carbon dioxide (ca), which, by the criteria of this study, began in 1850. As the authors of the study note, "plants have not been exposed to concentrations [of ca] above 290 ppm for at least 650,000 y, so the dynamic carbon–water coupling that prevailed for several millennia could be disrupted with potential, yet uncertain, impacts on hydro-ecosystem functioning." Elevated ca, in terms of plants' physiologic response, is known to correspond to iWUE—a measure of carbon uptake per unit of water lost—though iWUE may also be governed by variables such as assimilation rate (A) and stomatal conductance (gs), and how these variables ultimately affect a plant's internal carbon (ci). The authors cite three possible scenarios that explain tree acclimation processes in response to rising ca in relation to iWUE. Scenario 1 (S1) supposes a constant ci, in which iWUE increases robustly. Scenario 2 (S2) allows for a constant ci/ca ratio, in which iWUE increases moderately. Scenario 3 (S3) assumes a constant difference between ca and ci, whereby iWUE remains constant. S1 seems the most plausible scenario in the face of the CO2 fertilization effect, though few long-term data exist to further elucidate the specific nature of iWUE in a North American boreal forest, and much uncertainty exists in this respect. Against this background, Giguere-Croteau and colleagues present their findings. The researchers used a dual-isotope analysis of tree rings (δ 13 C and δ 18 O; carbon-13 and oxygen-18, respectively) to track changes in iWUE over a 715-year period. Their results showed "a remarkable and unprecedented (59%) iWUE increase over the past 150 y," the period tracking the onset of major anthropogenic atmospheric carbon emissions. Examination of dual-isotope data from this period revealed two distinct patterns of iWUE activity, each corresponding to two of the three iWUE scenarios described earlier. The first phase, spanning the years 1850 to 1965, corresponded to S1, where ci remains constant in relation to increasing ca. This time period showed a 28% increase in iWUE compared with the pre-industrial average from the preceding 550-year period. By 1965, when ca levels reached 320 ppm however, iWUE activity shifted to reflect a constant ci/ca ratio (0.49), as described in S2, and this was accompanied by an additional 31% rise in iWUE. The rate of increase in iWUE observed in the first phase of the study is among the highest ever seen in the Northern Hemisphere, and remarkable also in that the response occurred in already mature trees. The shift in activity from a constant ci to a proportional Ci/Ca relationship—a change in paradigm from S1 to S2—that took place in the second period beginning in 1965, was also remarkable. No such shift had previously been observed in a North American boreal forest. The observed shift in the trees' acclimation strategy suggested physiological changes either in A, gs, or both, and so the researchers looked to clues in the dual-isotope analysis to clarify the mechanism at work in both time periods. They found that in the first period, from 1850 to 1965, A (assimilation rate) stimulation by increased CO2 probably drove iWUE increases; but after 1965, the iWUE response likely changed to one dominated by gs, that is, in this case—declining stomatal conductance. In essence, these trees seemed to employ a strategy that maximized carbon gains at relatively low ca, as seen in period 1. However, beginning in 1965, the trees switched over to a drought-avoidance strategy as their photosynthetic apparatus approached a saturation point, after which water losses would be disproportionately high in comparison to carbon gains, were they to maintain a constant ci. Next, the researchers looked at variations in climate in relation to iWUE, examining variables such as soil moisture index, vapor pressure deficit, and temperature. Their analysis showed that, while each of these climate-related factors did have a significant effect on iWUE between 1953 and 2014, each had a maximal effect at a different time frequency. Moreover, the very large increase in iWUE beginning in 1850 could not be attributed to climatic changes such as the hotter/drier conditions that have prevailed since 1965. Evidence indicates colder and wetter conditions in fact prevailed, and the high stomatal conductance necessary for iWUE increases at the observed rate of the 1850 to 1965 period likely would not have been possible in hotter and drier conditions. The climatic trend of hotter and drier conditions may have played a role in facilitating the switch from S1 to S2, however. Perhaps the most important finding of this study though, is the fact that the unprecedented iWUE increases seen since 1850 did not result in substantially higher growth. Looking at ring-width indices from the trees, the researchers found periods of high growth from relatively recent modern times (1980s-1990s) of equivalent magnitude to other periods from well before 1850. The researchers offer several plausible explanations for this lack of apparent growth, ranging from growth of non-stem components of the three, such as root exudates, to nutrient limitations, for example, the effect of phosphorus on biomass growths in white cedars. Regardless, the results of this study serve as cautionary evidence to those developing dynamic global vegetation models (DGVMs) which rest upon the assumption that higher atmospheric carbon necessarily translates to greater carbon storage via photosynthesis to biomass. Thus the authors conclude: "Our results thus suggest that even in favorable conditions for growth, not all trees can take advantage of elevated levels of ca and iWUE. These mechanisms are not typically taken into account by ecophysiological models and DGVMs which may lead to them overestimating any positive effects bestowed by a higher ca on carbon assimilation and fixation. Predictions of elevated future growth and possible alleviating effects on ca might be overly optimistic if the models do not allow for the possibility of constant or even reduced growth in the context of increasing ca." It is not simply higher levels of CO2 that trees, other plants, and all living things on this planet need to deal with - as more energy is retained in a more closed system, weather extremes have been emerging. Not just extreme acute weather events like hurricanes or downpours, but more extreme weather patterns due in part to wider fluctuation of systems that produce "El Nino" types of effects, resulting in extremely wet or dry years or periods of years. Agriculture and food production are already feeling the effects. These kinds of effects are far more likely to be more devastating to human society and infrastructure than the CO2 content while breathing.